Nuworks has just produced instant-play versions of its most popular games, like Martian Mania and Moby Duck, and metro-style Lucky Club Casino (http://www.luckyclub.eu) is one of a chosen few online casinos to have them. This week, get Double Comp Points when you take them for a spin! Bank Bandit is another one of their slots that Lucky Club has just introduced in new instant-play format. Now you can also play single-hand and multi-hand video poker games such as Deuces Wild and Joker Poker without downloading and installing anything. Until next Monday, January 19, earn double comp points when you play any instant-play games which can be accessed from the casino’s website: http://www.LuckyClub.eu. 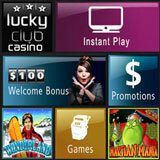 Lucky Club Casino offers video slot machines, video poker games and table games like Roulette and Blackjack. New players anywhere in the world are welcomed with a $100 Welcome Bonus.